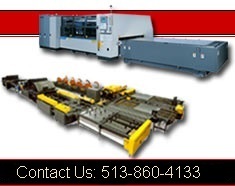 Shears| Betenbender |Betenbender Sheet Metal Fabricating Machinery | Betenbender Shears | Cincinnati Precision Machinery, Inc.
Betenbender designs simplicity and safety into its Hydraulic Shears -- with an advanced hydraulic system and flexible operation. They're easy to operate, easy to maintain and able to withstand the rigors of today's production demands. Easy Material Handling: A sturdy backgauge and rake angle adjustment minimizes twist and distortion. This makes it possible to increase the rake for cutting heavier stock and extend maximum capacity of the machine. A 4’ squaring arm with recessed scale makes for fast, easy measurement. Modified High Carbon, High Chrome Reversible Knives: Provide four separate edges for clean cuts and long blade life. Easy blade gap adjustment means precise cuts for a wide variety of materials. Electrical System: Meets NFPA79 and construction requirements of the ANSI B11.4. All machines have disconnect switches, magnetic starters, 110/120 volt controls, and 220/460 voltages. 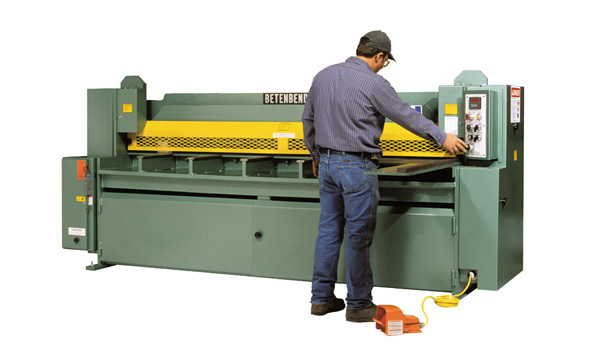 Backgauges: A Betenbender Hydraulic Shear is capable of shearing 1/8" (10 gauge) material to the following tolerance: Dimension - The width of the off-cut portion of the work- piece is within ±0.005 inch of the backgauge setting. Inlaid Scale, 0 - 48"